From the artist: Come see a Chinese brush with a Minnesota spirit. Original paintings, prints, cards, scrolls, Chinese calligraphy, inspired by the landscapes of Minnesota and interior landscapes of human experience. 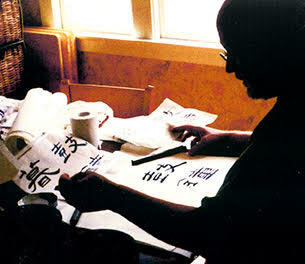 Bob Schmitt is both a student and teacher of Chinese calligraphy and painting. He has studied for over 18 years with Hong Zhang, a Chinese native from Shanghai. In the last 25 years. he has built a body of work, a following and a reputation for capturing the essence of beloved Minnesota landscapes (Minnehaha Falls, the North Shore and the Minneapolis city lakes). He does this through the use of traditional Chinese brush painting techniques. Bob is known for works that spark the tender memories of those who hold these scenic wonders in their hearts. His most recent work is a series of scrolls called the Nice Gates: Thresholds of a Spiritual Journey. In this series Bob focused the skills he had developed capturing the ephemeral beauty of recognizable landscapes to examine the internal landscapes of darkness, abandonment, longing, emptiness, compassion, rage, oneness, unbridled joy and delusion. This series integrates his techniques of Chinese brush painting with the exploration of digital manipulation, image cloning and ink jet output.